INDEAL Inc., the largest purchasing organization for the contract furniture industry, has selected ergoCentric Seating Systems (ergoCentric®), North America’s leading ergonomic seating systems manufacturer, as its primary supplier of ergonomic task seating. ergoCentric’s product offering, including the tCentric Hybrid™, airCentric™ and geoCentric™ series of task seating, boosts INDEAL members’ buying experience by enhancing their product selection to include the most ergonomic seating options available. 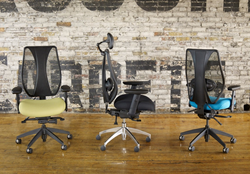 ergoCentric’s latest task seating offering, tCentric Hybrid, is the first fully ergonomic mesh-back task chair. Unlike other mesh chairs, the entire backrest of the tCentric Hybrid – not just the lumbar pad – adjusts vertically. This ensures the lumbar pad remains in proper alignment with the contour of the backrest frame, resulting in the best lumbar support of any mesh chair. And five inches of infinite adjustment means the backrest can fit virtually everyone. Incorporating the latest high-tech elastomeric mesh, the tCentric Hybrid’s backrest is tensioned for optimal support. The tCentric Hybrid, as well as the airCentric and geoCentric series of task seating are featured in INDEAL’s Idea Book for Business 2016 is available now.